There were very few changes announced today, probably because everything has already been changed. The only ones we are seeing today are sailings that are affected by their turnaround ports just not being ready early next week, or ones where they storm just is just in the way. The complete story, along with the list of today's changes, appeared in the September 8 edition of Cruise News Daily. The North American cruise industry has more or less ground to a halt, which everyone watching Hurricane Irma and dealing with changes the storm is causing. Complicating matters is that the people needed to plan and implement the changes are themselves next in the path of the storm. Most cruise lines' headquarters shut down this afternoon or this evening, with some of the employees staying behind to work in hurricane-proof portions of the cruise lines' headquarters buildings, some evacuated to work remotely, and other functions (such as reservations) to be handled exclusively from offices in farther west in the United States. Those offices themselves were born out of past hurricane scares when South Florida was in the path of storms. It now appears Irma will arrive in South Florida Sunday morning and at Port Canaveral on Monday. Most cruise lines seem to be anticipating the South Florida ports to be reopening on Tuesday. Details and a complete list of changes appeared in the September 7 edition of Cruise News Daily. Carnival Corp entered a new era today when Meyer Werft laid the keel for AIDAnova, the first of seven LNG-powered ships on order by Carnival for four of their brands. These will be the first cruise ships to be 100% powered by clean-burning Liquified Natural Gas both at sea and in port. The ships will be produced at both Meyer Werft at their yard in Papenburg, Germany, and at Meyer Turku in Finland. 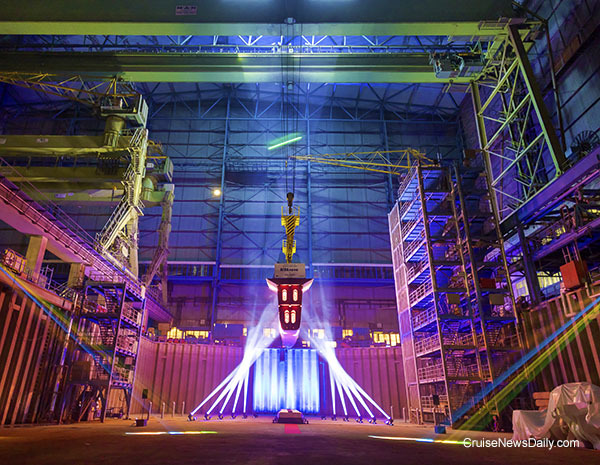 In a flashier-than-normal event, Meyer Werft lowered the 120-ton block into the building dock. As Hurricane Irma thrashes on westward in the Caribbean, cruise lines have spent their night and today trying to decide when the storm will make its northward turn and then decide what to do with the ships. Throughout the night and today, each update of the computer models and each update of the National Hurricane Center's prediction has moved Irma's track a little farther east after its northward turn, so that the eye now appears to be going up the east coast of Florida until it gets to Florida's northeast corner. Details appeared in the September 6 edition of Cruise News Daily. Hurricane Irma is at the eastern edge of the Caribbean and ready to move westward along the northern edge of the Caribbean and striking some of the most popular cruise destinations. When it reaches as far west as Florida, it currently appears that it will make a northward turn and envelope Florida as it moves north. To make matters worse the timing during the week precludes cruise ships from going around the storm and following it, and it's going to mess with South Florida over the weekend just when so many cruise ships need to turn around. The complete story with all of the changes appeared in the September 5 edition of Cruise News Daily. A fight involving Norwegian Breakaway passengers in Bermuda results in a fine for the passengers even though they were robbed. MV Werften is now producing their own passenger and crew cabins at a rate of one every 20 minutes through the day. Details appeared in the September 5 edition of Cruise News Daily.